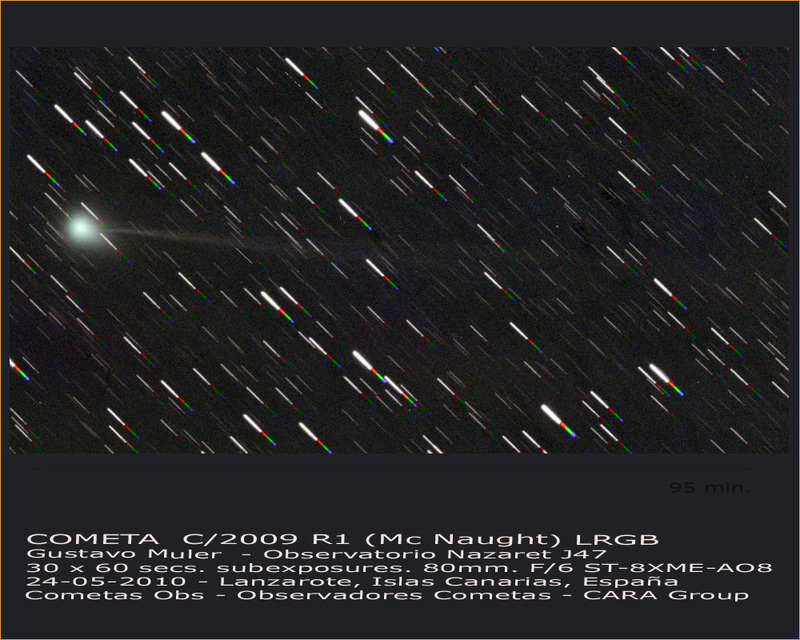 Have we seen the best of comet C/2009 R1 (McNaught) already? The first two weeks of June produced a flurry of great photographs, but this has come to an end as the window of (good) visibility is decreasing again. 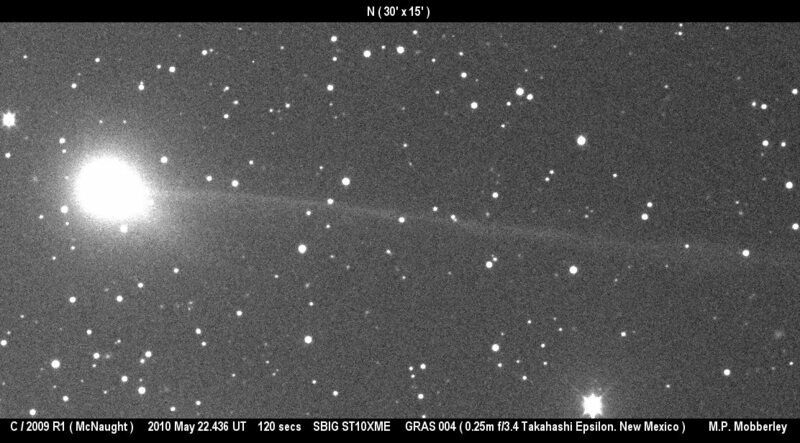 And a detailled analysis also raises doubts that McNaught will reach 2nd magnitude: It may stop at 3.5 to 4 mag. which is pretty bad given the poor viewing geometry. 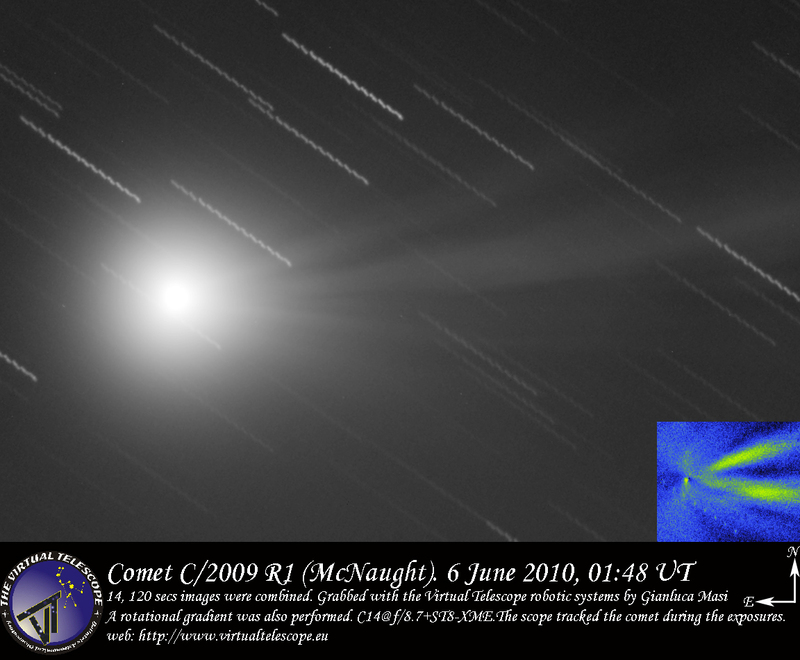 The report also hightlights the fact that the coma is very small, only a few arc minutes, and the ion tail - which photographers saw at up to 7° in length - very faint visually: In 'normal' binoculars (which this blogger has also pointed at the comet repeatedly) McNaught is just a tiny fuzzball, reminiscent of a distant globular cluster perhaps, and the same goes for small telescopes. 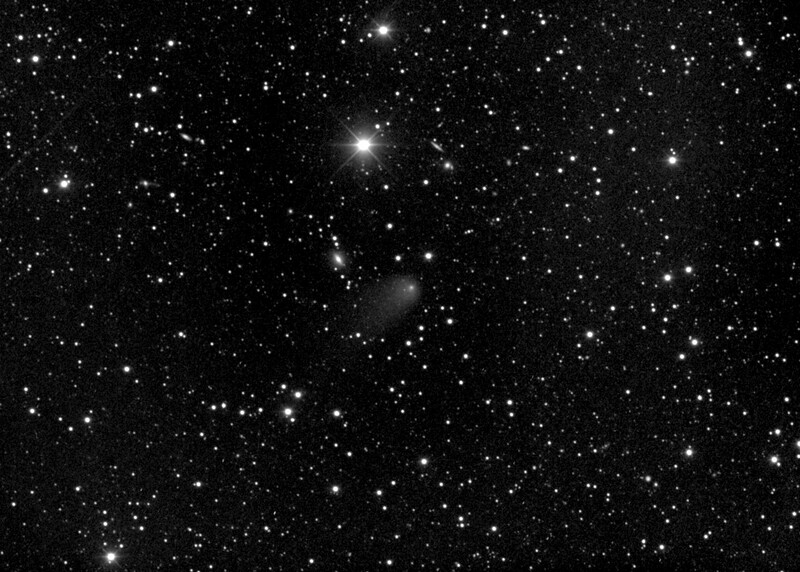 Only in huge binoculars and big telescopes does the comet give something to the visual observer. The June 3 Jupiter impact left not the slightest trace in the clouds of Jupiter, even with the vision of the Hubble Space Telescope, as also reported here, here, here, here, here, here, here, here and hier. There are many ideas why nothing was seen after the impact which had earlier made news also here, here, here, here, here, here, here and here. • Constellation-wise here are Venus & the Moon on June 15; it's now a good time for this and other planets in the evening. E.g. here are Mars on June 4, the Mars/Regulus conjunction on June 6 (more and the view from down under) and a Tethis-Dione event at Saturn on June 5. • In the distant solar system the results of the first-ever observed stellar occultation by a Kuiper Belt Object have been published and a rather big one has been discovered - while comet Hale-Bopp was detected by Herschel at 30 AU from the Sun. In other news the first two dwarf planets are in opposition (with Ceres being much easier than Pluto, of course), and a stellar occultation by asteroid (80) Sappho has yielded nice chords. • There is some speculation that the 2011 Draconids could have an outburst, while others see a maximum ZHR of just 40 to 50 or even just 10 - nonetheless commercial tours like this and this one are being offered to watch the shower/outburst/storm. Which happens around full moon, though. • Another "meteor caused fire" nonsense evaporated quickly in Canada, also the story of NWA 5400 and NASA asking for help in finding meteorites. Plus more arguments against an impact/Dryas link and about the meteor poem (more). • Speculations and warnings regarding the future behavior of the Sun made many headlines, such as this, this, this, this, this, this and this, letting some scratch their heads over contradictions. • There is no mid-eclipse brightening of Epsilon Aurigae so far, while something strange is happening regarding Eta Carinae's stellar wind. • Sightings of NLCs are now on the increase, with observations e.g. 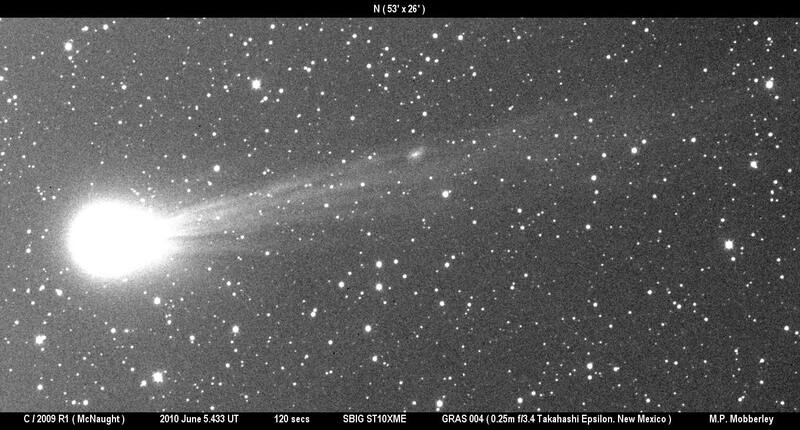 on June 16, June 15 (also a video), June 14 and June 13; earlier they were rare, and a claimed sighting in Austria on the 9th is thought erroneous now. • A nice sunset from the ISS made headlines, and there is an analysis of the Icelandic ash from the volcano plume. • An ISS transit and more on the Falcon 9 spiral over Oz (more, more, more). 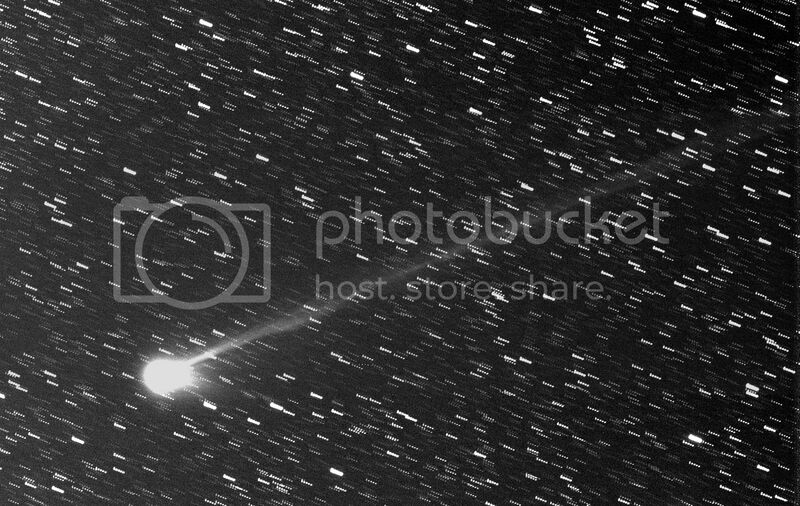 • The reentry of Hayabusa resulted in a brilliant sky show over Oz: more images here and here. 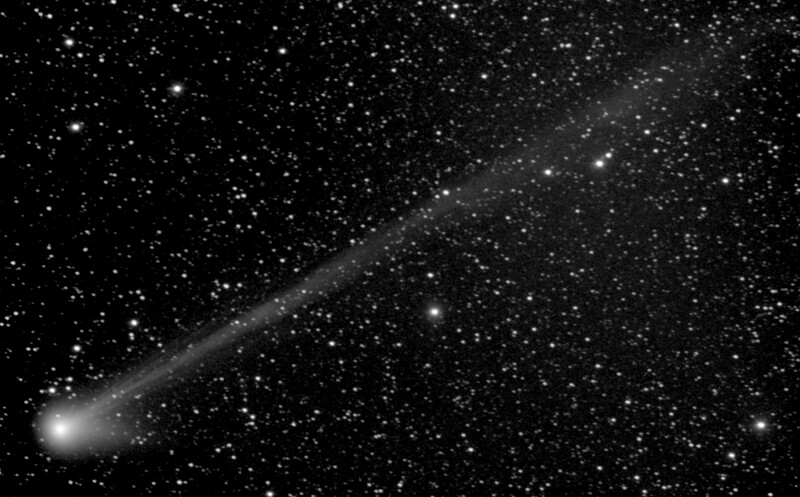 • PanSTARRS is now operational and finding supernovae. • And finally a transportable 107-cm amateur scope with a convenient eyepiece position! 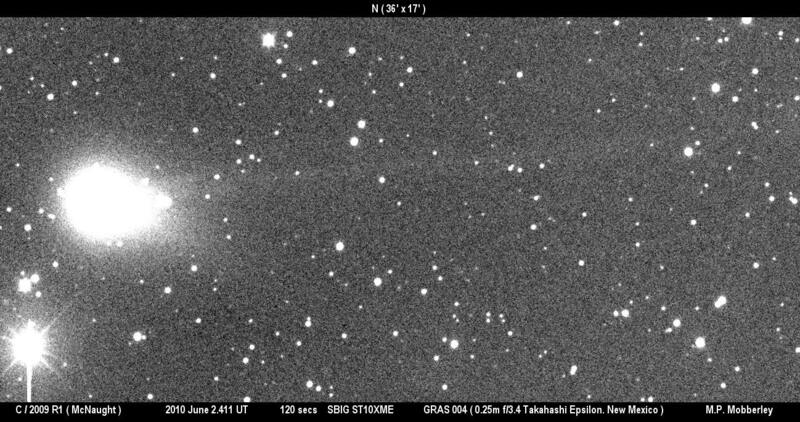 The two most avid Jupiter watchers in the 'Eastern hemisphere' have simultaneously observed something hit Jupiter on June 3rd at 20:31 UTC, causing a short bright flash - but since then no dark stuff has been reported at the impact site as had been seen easily after the 1994 Shoemaker-Levy 9 impacts as well as the July 2009 impact. Anthony Wesley in Australia observed the impact in realtime and got a great video at 60 fps. He immediately alerted the world, including Cristopher Go in the Philippines who had been recording Jupiter blindly at the same time: His video caught the same flash at the same time in the same location, and since he was in a very different place on Earth, the reality of the event is out of the question. (A similar flash on Jupiter in 1983 lacks such confirmation, unfortunately.) As reported in this forum, this report and on SpaceWeather, no traces whatsoever of the impact have since been seen; see also pics from June 4 and June 5 that show the site and follow further developments through JALPO's collection. As usual these days, reporting of this solar system event fell largely to astronomy websites and blogs, with the 'main-stream media' lagging behind (though getting some soundbites from bewildered experts): Here are some stories from Sky & Telescope, the Planetary Society Blog (earlier, still earlier), the Cosmic Diary, the Gish Bar Times (earlier), Random Thoughts, AstroBob, Comets & NEOs, Cosmic Log, Catching the Light, Discovery, Astronomy, Ars Technica, Nat'l Geographic, Bad Astronomy, New Scientist Blog, Eureka, Science Blogs, KosmoLogs, Astronomy Now, Space.com, News.com.au, Science News and BBC. And for historical context, the author of this paper tells this blog that he still sees not one clear historical case of a Jupiter impact pre-1994. • Talking about Jupiter, the 'loss' of its SEB is still making headlines, e.g. here, here, here, here and here. 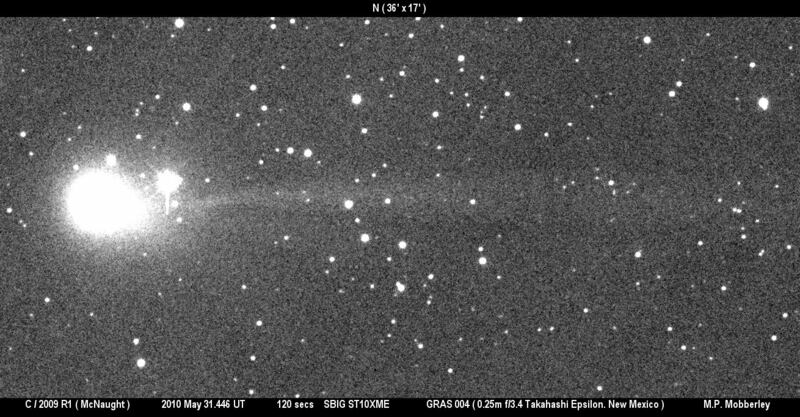 • Interesting data from last years occultation of 45 Cap by Jupiter were presented at the Planetentagung 2010, notably a lightcurve from Hakos (Namibia) and a glorious video from Calar Alto (Spain): The star went and came back multiple times over 1/2 hour while 'scanning' Jupiter's atmosphere! • Numerous events involving Saturn's moons were observed by B. Gährken, including transits of Titan (from Australia). Also a May 24 pic of Saturn, rings still narrow. 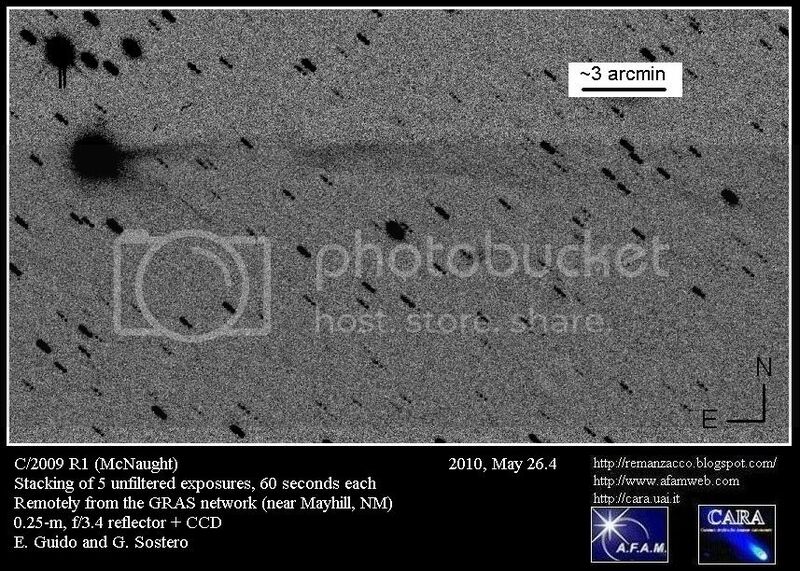 • Two results from the opposition of Mars 2010: a map and the best pictures by another observer. 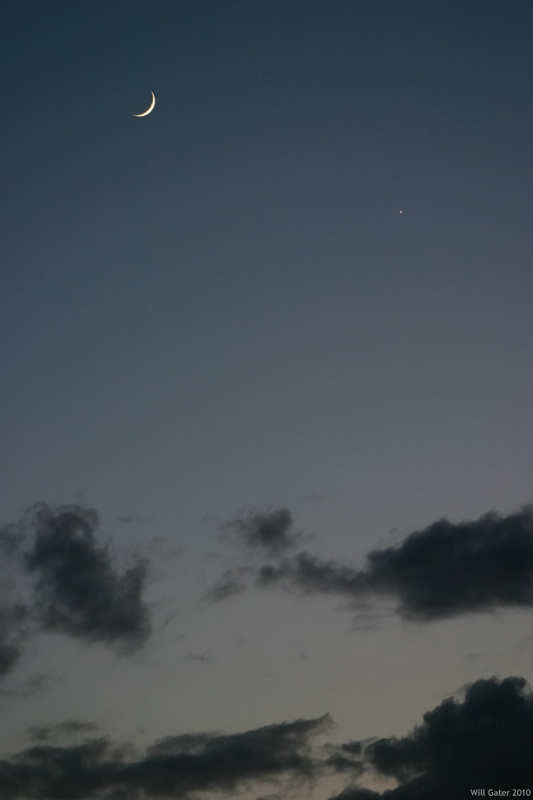 • Venus on June 3rd. • The Moon occulting Venus was observed in the Philippines (more, more, more, more and more) and Hongkong at night and India (video; low-res pic) and Greece (more, more, more and more) in daytime, while a close daytime apparition was seen from Germany and the ISS (dito). 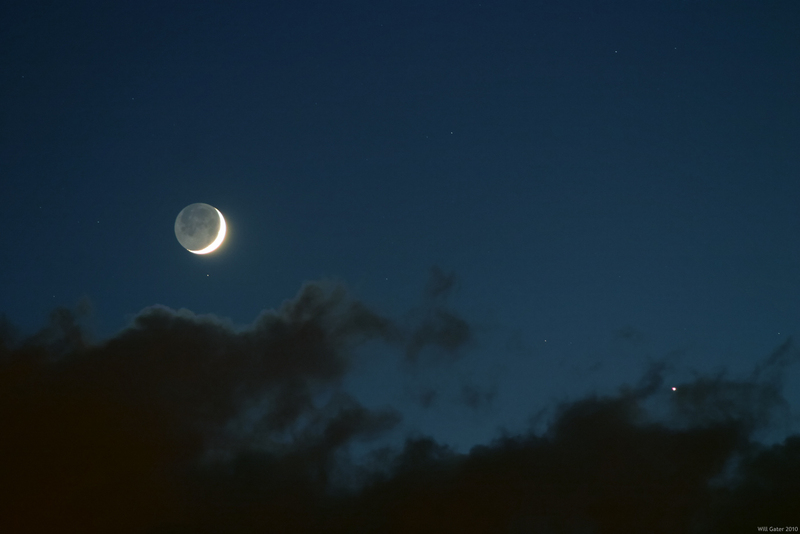 More pics from the 16th are here, plus further evening views of Venus & the Moon from May 17 in Namibia, May 16 in the U.S. (more), the U.K. (more, more, more, more, more, more), India (wider, very wide, dito, wider, dito, dito, dito and an animation) and Australia and May 15 from the U.S. (earlier, more, more, more), the U.K. (earlier, other site) and India. Meanwhile this handy calculator gives you more planet occultations by the Moon! And we have weather stats for the 2010 Transit of Venus. 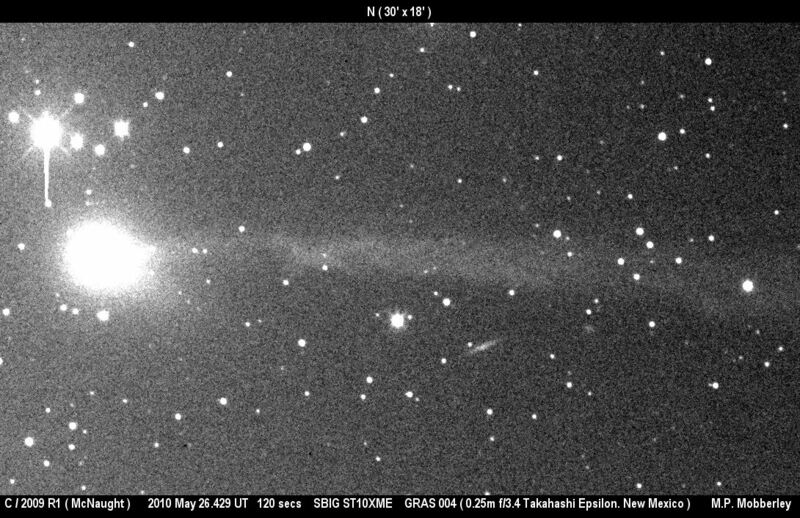 The McNaught show is underway as the comet C/2009 R1 - see previews here, here, hier, hier and hier - has now brightened to ~6th mag and has a nice structured plasma tail: You can find growing picture collections here, here and here as well as selected pictures of June 5 (more, more, more and more), June 4 (more and more), June 3 (more and more), June 2, May 31, May 30 (more), May 29, May 26 (annotated, animation, more), May 25 (more), May 24, May 23 and May 22 (more, more, more). 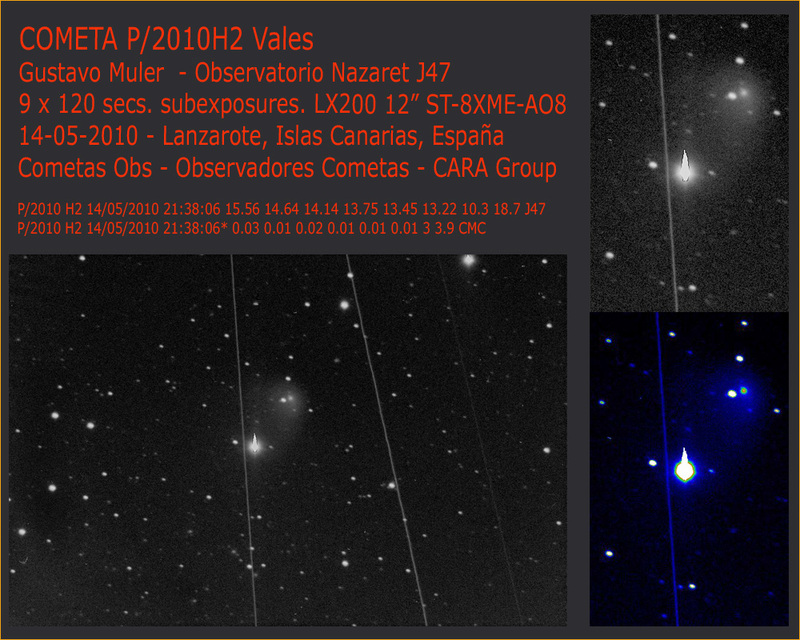 • For C/2010 H2 (Vales) we have another analysis and pics of June 5, June 2, June 1 (more), May 22, May 16 (more), May 15 and May 14. Also a paper on the outburst of Holmes. • Wild 2 on May 18. 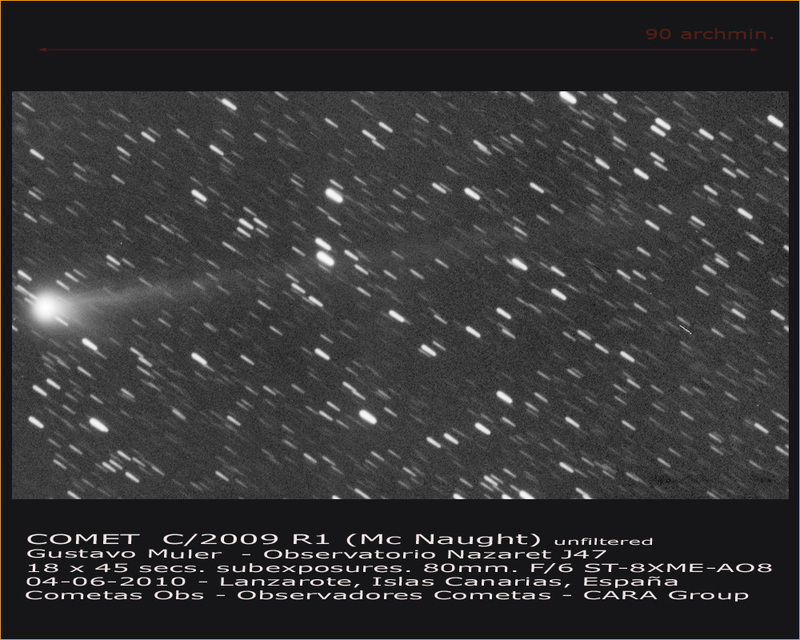 • Joint STEREO & SOHO observations of a comet hitting the Sun (more, more, mehr). • Talking about the Sun, thoughts on its irradiance and effects as well as recent behavior, also summarized here. 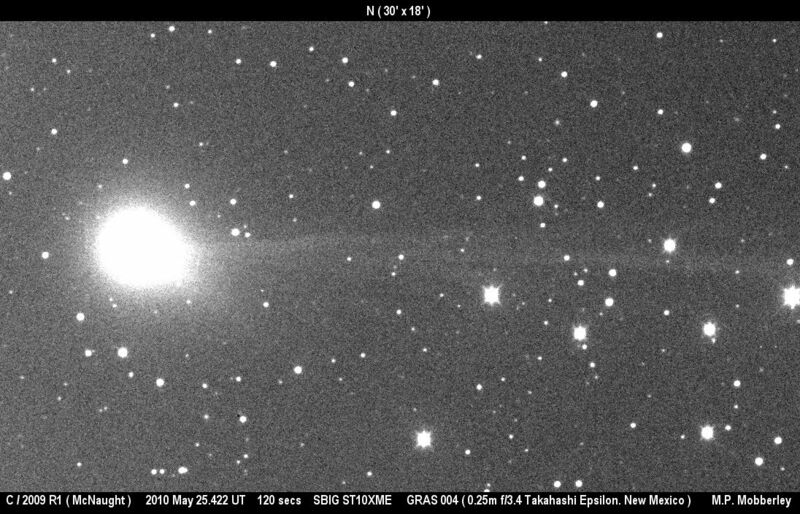 In other news There seems to be the - predicted - mid-eclipse brightening of Epsilon Aurigae, we have a supernova impostor and the real SN 2010dn in NGC 3184 (the discovery photo by Koichi Itagaki w/60 cm) as well as a transit of TrES-3b. • "Asteroid" 2010 KQ is probably man-made (more, earlier, more, earlier, more, mas and more). 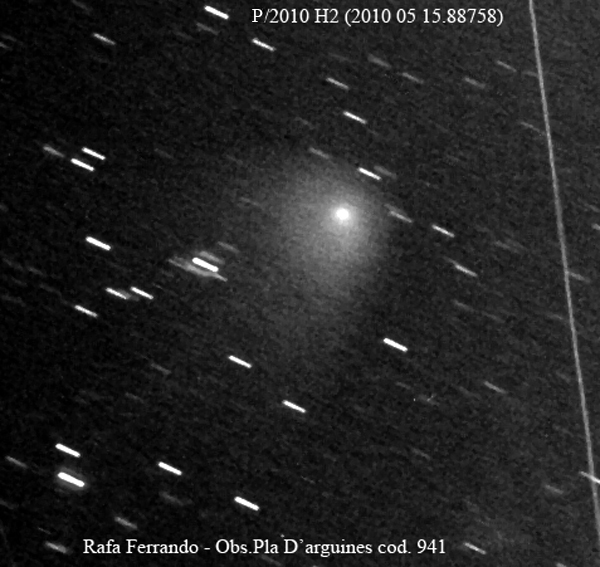 • A report on the fast fly-by of 2010 KO10, a possible impact-role in Antarctica, a meteorite recovery in Oregon, a twisted meteor (probably only the camera was shaking) and a meteor story in an old poem (more, more and more) • Plus a visit to Arecibo - and astrophotography from Puerto Rico. • The first NLCs (a preview), subtle volcanic dust effects on the Sun (also nighttime tracking w/Calypso, the need for a space-based laser, volcano science, measuring flights and the need for limits). • A veeery old newsreel on amateur astronomer Percy Wilkins. • How to build your own planetarium. • A sky show over Australia - great video! - after the Falcon 9 launch. 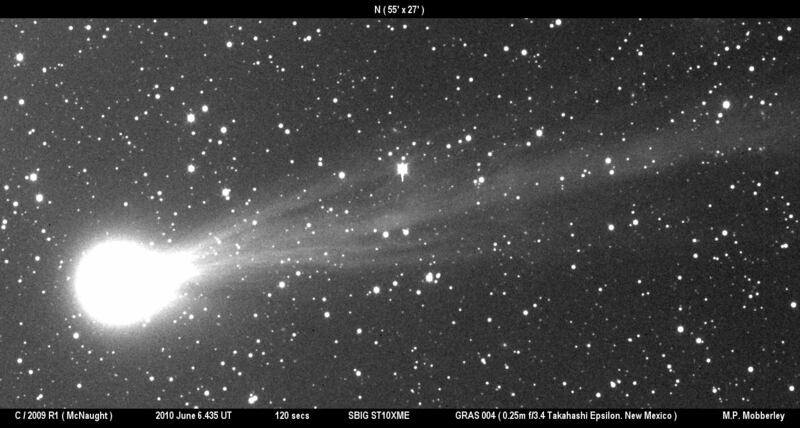 • Amateur imaging of KH 11 satellites (with some doubts re. 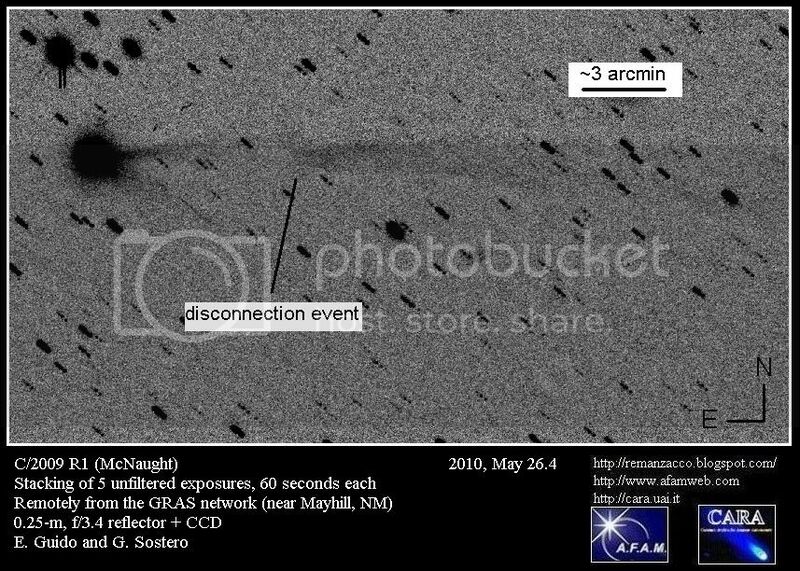 image processing), the X-37B (see also here ["Amateurastronomen ..."] y aqui) and the ISS on May 16 and May 22 (more) by T. Legault and May 23 (hi-res) as well as in daytime. June 6: Mars close to Regulus, should feel equally bright although Regulus is 3x10^6 times farther away. June 19: Dwarf planet (1) Ceres in opposition, reaching 7.1 mag. Also noteworthy are two spaceflight events which are 'unavoidable' thanks to celestial mechanics: On June 13 Hayabusa will return to Earth (the third of four trajectory corrections was just successful, with Australia now in the crosshairs), and on June 27 EPOXI will fly by Earth (a necessary trajectory correction was successful, too) enroute to comet Hartley 2.